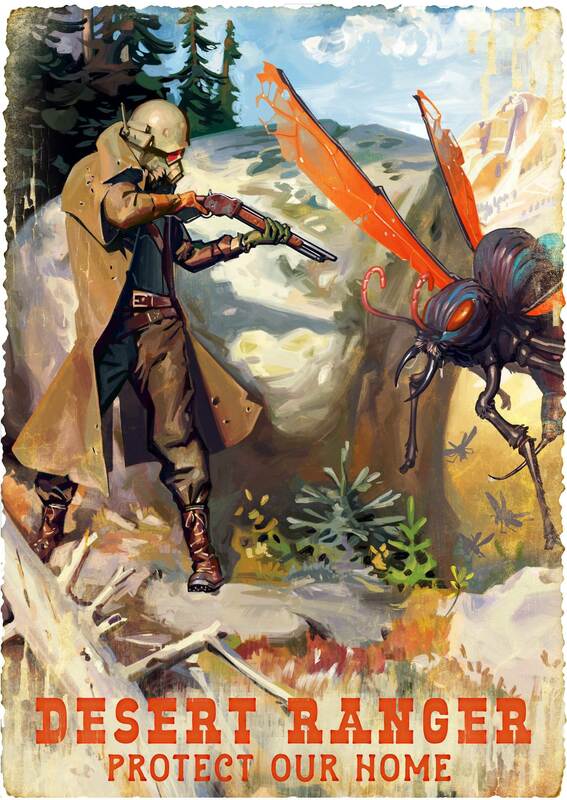 When he tried to match the ranger with the big iron on his hip"
The bones and corpses that litter the irradiated soil of the United States are a testament to that. Once pillars of atomic inferno scorched the earth and boiled the sea, war was pretty much all that humanity had left. In the 21st century, humanity had become a virtual utopia; an advanced civilization, dismissing the atomic genocide of the past as an ugly necessity for the future ahead. The economy was healthy - the poverty rate had drastically plummeted - it seemed that the American Dream had finally been realized. A heated home, a family of four, and scientific luxuries people of the past couldn't dream of. But hidden behind the white picket fence was an ugly truth; humanity had not yet grown beyond it's lust for war. The years of flagrant consumption led to a lack of resources. Unneeded wars raged on overseas. Countless smaller nations collapsed. And humanity's utopian chapter seemed to be coming to a close, ready to begin anew. In the year 2077, humanity was bathed in nuclear hellfire as punishment for it's greed. The past triumphs, accomplishments, and errors had been reduced to a fine irradiated dust. The world's face permanently disfigured, the survivors of the atom bomb wandered the wastes of the post-apocalyptic nation, scavenging towns and building a foundation for another, better tomorrow. But with progress came chaos. Raiders assaulted blossoming towns, and mercenaries grew in numbers. As several centuries passed by, humanity seemed to be rising again. Settlements and cities arose from the ashes of the past, governments grew in power, and people forged a new beginning for themselves. The West, a barren, turmoil-filled wasteland, became the birthplace of powerful civilizations like the NCR, Vault City, and Caesar's Legion. The New California Republic, a powerhouse of the West, has been steadily expanding their territory. As it so happens, their expansion would lead them straight to their soon-to-be mortal enemy: Caesar's Legion. The conflict between the two nations is a hard-fought one, with countless dead on either side and thousands of lives ruined for simply being in the crossfire. However, all of this are simple rumors or history to most of the people living in the ruins of Minnesota. In the snowy reaches of the North Star State, a chance encounter between two very unlikely individuals would throw the whole region into turmoil. Burdened by the things they've done in their past, both men seek redemption yet at the same time distance themselves from the road that would lead them to it. Perhaps, by finding one another they might finally see the truth. Perhaps, they will shed the legacy that drags them down. Or maybe, they will simply just go down the same road they've always gone for the rest of their life. All this remains to be seen. There are many paths to redemption, and sometimes you can't walk the road alone. As the end of their road draws ever closer, the future looks bleaker than ever, because war…war never changes.